Use the astrology tab to get information about the compatibility of two zodiac signs. Choose your own zodiac sign and gender. 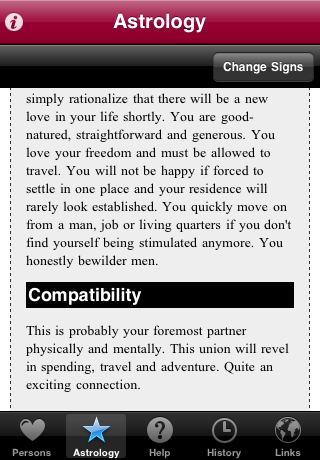 Then click on the button for your partner and select his/her zodiac sign and gender. Click on "Done" to show the full compatibility information. If you need support for this app, please fill in the support form and make sure to include the iPhone OS version number and the language of your device. Euregio.Net and EasyScopes are registered trademarks of Euregio.Net AG. LoveTest, DailyScopes, GuruHits, SpeedyCam, 0800-Horoscope are trademarks of Euregio.Net AG. LoveCalculator is a licenced trademark. This site works in all browsers but is best viewed in Safari or Firefox.